I am a lifelong resident of Lebanon and Laclede County. I graduated from Lebanon High School and earned a business (BA) degree from Drury University in Springfield, Missouri. I then went on to earn my law degree (JD) from the University of Missouri at Columbia. Following law school, I returned to my home and have been practicing law in Lebanon and the surrounding area since 1988. I am licensed to practice in state and federal court in Missouri. I am a partner in the law office of Allen & Rector, P.C., and we have office in Lebanon, Missouri and Waynesville, Missouri. I have represented clients over the years in state trial court, federal trial court, state appeals court, tax court and before a number of state and federal administrative agencies. 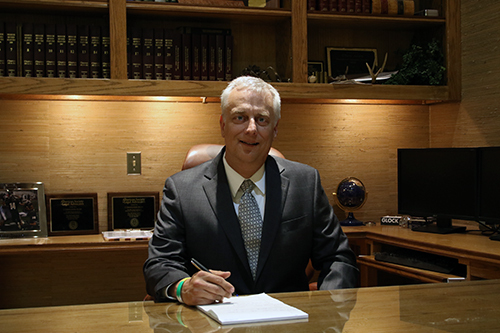 I was named a top area attorney in 2010 and 2011 by readers and subscribers of the Lebanon Daily Record Newspaper. I enjoy the practice of law, dealing with people, and solving issues and problems. I am married to my wife Melody and we have three sons, Clint, Stuart and Josh. I enjoy spending time with my family, outdoor activities, travel, working in our shop, doing metal work, automotive fabrication, and racing. I am a member of First Baptist Church in Lebanon, Past Executive Board Member of Missouri Baptist Convention in Jefferson City, Missouri. I served two terms as board member and officer of the Lebanon R-3 School District, in Lebanon, Missouri. I am a past President and Board member Lebanon Area Chamber of Commerce. I enjoy representing the citizens of my community as Counselor for the City of Lebanon, Missouri. I am very privileged to serve as a Board of Director for Kingdom Sports in Nixa, Missouri and as a Board of Director for Project Hope, Inc. in Springfield, Missouri and Kansas City, Missouri. These faith based organizations meet the physical and spiritual needs of the very poor in Nicaragua, Haiti, Mexico, and a number of other countries. We hired Mr. Allen for our probate case and our estate case and any other cases we need a attorney for he is very professional and his staff are to they do whatever you made need they make sure you are happy and that they are doing whatever you need we would recommend Mr. Allen and his law firm to anyone we are very pleased with Mr. Allen. We have used Mr Allen as our attorney on many occasions he and his staff are very professional and very personal we would not use any other attorney or law firm and we refer him to anyone who would need a attorney. When I came to Chris with my situation I was scared and unsure about how smooth my particular legal process was going to be. He took his time to explain and set my mind at ease. He was extremely patient with my questions and he was very thorough with his. He gave me exactly what I was needing when it came to legal representation. We had hired Chris for getting legal custody of Robert. A few years later in 2014 we decided to adopt him. Chris was great the first, so we would hire him again . He knew just what we needed to do . He was helpful, timely, and courteous. Very professional. I had talked with Chris about 2 weeks ago about a problem I have out of state. I don’t deal much with lawyers and I needed advice. Knowing he was a gun dealer as well I knew he would have the best advice and know what I was talking about. He did! He was from the start right with me as I told him my situation knew of the product in which I was talking. I hired Chris for a felony charge, it was my first and only felony charge and he made me feel safe and calm under these dire circumstances. He always kept me informed about my case and ended up dropping my charge to a class C felony for a class B. I couldn’t be more thankful and I would highly recommend his services to anyone in his area.